← Who’s the True Patriot? I finally caught a fish on the Grand. Most trips I’ll make a few perfunctory casts but our trip is all about paddling forward, while fishing requires that one not be in a hurry to get from one spot to another. My brother never cared much about fishing – even when we were kids – so there’s that, too. I start casting and he starts drumming his fingers on the Billie V’s gunwales and humming impatiently. On this trip I had resumed my rightful place, as the strongest paddler, in the stern seat. I saw the resulting after-splash of a leaping fish, starboard and ahead of Tom’s subservient seat in the bow. My fishing pole – in its pink, floatable carrying case – lay at my feet. “Thar she blows! Hold ‘er steady,” says I, quickly and quietly unsheathing my Zebco harpoon. One perfect cast and – wham! – the Leviathan hit my spinner like a rogue gator introducing itself to a curious Shih Tzu. Other thoughts: the river at our put-in spot for this leg of our journey – the Ionia Fairgrounds – is rather dismal. City Mothers and Fathers would do well to haul away the dead trees that line the riverbank, providing first-time visitors with an uncaring greeting to their otherwise-attractive city. And we like Ionia; indeed we do. We didn’t see a heron, our spirit guide, until we were four miles into our 10-mile paddle. That is most unusual and I was beginning to worry, thinking perhaps this stretch of river was cursed. Herons are usually sighted early and often, leading us down the river. I love that Saranac has a sign geared towards paddlers on its bridge spanning the Grand. Makes a guy want to stop and spend some money . . . other river towns might take heed. I always take the river’s side; Industry and Big Agriculture have plenty of friends already. Thank you for visiting our blog, please share it with a friend. You may contact us by leaving a comment here or via email: joe@lenthofthegrand.com (Joe Neely) or tom@lengthofthegrand.com (Tom Neely). We would love to have you join us on the river, but it’s BYOC. 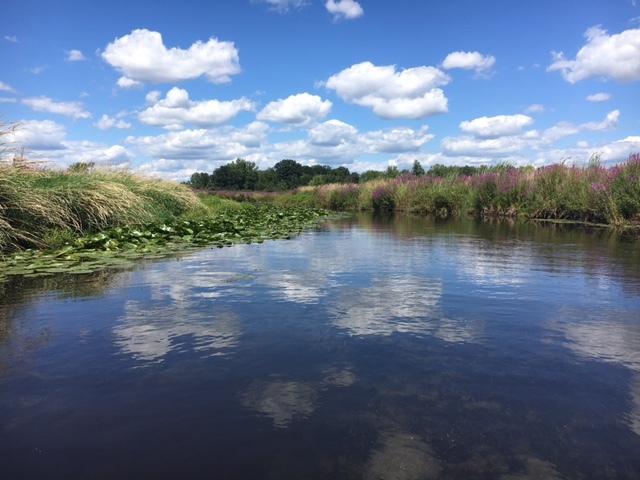 This entry was posted in Environment, Michigan, nature, paddling, Uncategorized and tagged brothers, canoeing, fishing, Grand River, Ionia MI, Michigan, Saranac MI. Bookmark the permalink. Sorry…😂😂😂 about the fish. I am sure that it was bigger than what it appeared in the picture. I do think that towns that welcome paddlers from the bridges are well worth shopping. Congratulations on the catch! Love your stories! The imagery of a “rogue gator introducing itself to a curious Shih Tzu” is hilarious. I follow your adventures with great interest!